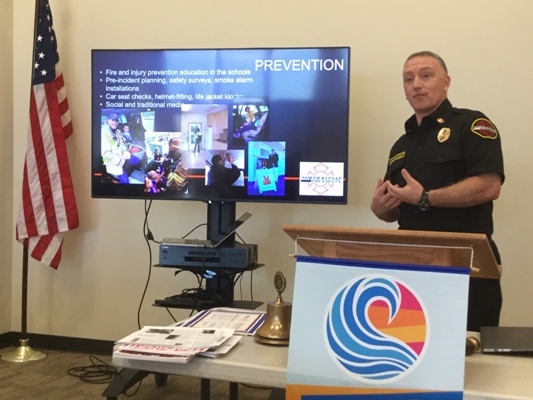 North Kitsap Fire and Rescue Assistant Chief Rick Lagrandeur spoke to Kingston-North Kitsap Rotarians at their October 10 meeting. The Chief explained the November 6 ballot measure, Proposition 1, which would increase NKFR’s revenue $1.6m annually 2019-2022. If passed, Proposition 1 would replace a 1999 Capital bond measure, and a 2014 maintenance and operations levy. NKFR’s Prop 1 materials state that it cannot continue to maintain current levels of service without the additional funds to pay for increasing operational costs and capital needs long deferred due to revenue limitations. Lagrandeur said the current district is the result of four districts combining in three mergers over the years. Their motto is “Proud to serve in the protection of lives and property.” There are four stations in the district, with a minimum of nine firemen on duty at all times. All personnel are cross-trained in both fire and EMT. Interesting statistics: NKFR responded to 3052 calls in 2017. Only three percent of those were for fires. 64% were for medical. Not stats were given on “cats in trees” calls.